It's rumoured that pint-sized popstar Prince thrives on three hours sleep a night, and Margaret Thatcher allegedly ran the country on just four hours kip back in the 80s. But in Derby we have our very own sleep-deprived superstars who get up well before the crack of dawn to make arguably some of the city's best bread. Yesterday I went for a potter into town on my lunch break and ended up in Baked, a bakery and cafe on The Strand in Derby city centre. Husband and wife Tony and Victoria opened their business just over nine months ago and as well as offering cakes and snacks, theirs is one of the few places where artisan bread is baked on site. Baked in The Strand. The puzzled little old ladies made me giggle! Now, bread really is one of my bugbears because it's just not something we do very well in this country at all. On the continent it's so easy to find really great freshly-baked bread - cafes, corner shops and market stalls all seem to offer quality crusty loaves and French sticks. But back home in Blighty the main offerings seem to be those horrible, aneamic, floppy sliced loaves in plastic packaging and giant, stodgy baps. I passed an HGV lorry the other day emblazoned with an advertisement for one of our well-known brands of bread and the slogan suggested that this particular company was at the cutting edge of making top quality loaves. I had to laugh - but unfortunately so many people in the UK really do believe that this is what constitutes good bread. And when it comes to bread, you've got to hand it to the supermarkets, who are actually doing a fairly decent job. Before starting this challenge I was a regular at Morrisons' bakery section, where you could at least pick up a fresh ciabatta or sourdough loaf. That's why I was so delighted to find Baked. Tony is a self-taught baker and makes a range of brown, white and wholemeal loaves and rolls, sourdough, ciabatta and speciality breads such as olive, and walnut and orange, on site. He gets up at a mind-boggling 2.15am EVERY MORNING and spends around seven hours baking to make sure that the shop can offer fresh bread daily. Victoria laughed as she recounted to me how she now manages to sleep through Tony's alarm going off, but then gets up herself just two hours later to make all the fresh cakes and scones sold in the cafe. I asked her what time the couple go to bed, expecting her to tell me that they tuck themselves in at about 6pm. "About 11.30pm!" she replied. "We really don't get much sleep!" And what about a lie-in at the weekend to catch-up? "Oh yes, I stay in bed on a Sunday," said Victoria. "I can sleep until 6.30am on a Sunday." My god, 6.30am would constitute a very VERY early morning for me, but to Victoria it's a luxurious lie-in. 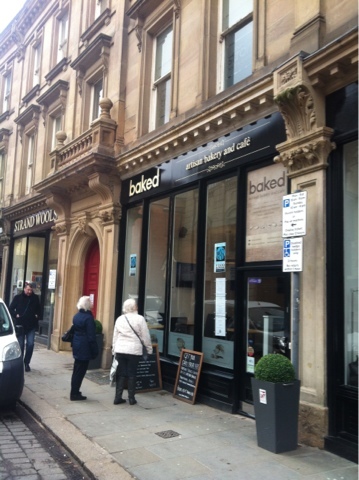 I was also delighted to find that the bread at Baked is very reasonably priced. Sometimes artisan bread can be expensive, which is I suppose when so many people end up buying cheap sliced loaves instead, but the prices at Baked compare to supermarket prices for better quality bread - with rolls at 35p each and a large ciabatta at £1.60. When I told Victoria what I thought of her prices she simply shrugged and said: "It's just bread. It shouldn't be overpriced." And this was seriously tasty bread. I say was because I went home last night and troughed pretty much the whole ciabatta to myself - it was so good. I didn't even have any tea - just the ciabatta with butter and then a pancake for dessert. I think it was probably one of the best ciabattas I've every tasted. I'm going to make it my business as part of My Year Without Supermarkets to find as many places selling really good quality bread as I can - as well as trying some some bread recipes of my own. I've already found that Jack Rabbits, in Derby, selling artisan bread made in Crich, Derbyshire, and a cafe/deli called Meringue, in Chesterfield. I'll write about these places in a bit more detail over the coming weeks. I've also found details online about The Real Bread Campaign, run by charity Sustain, which is fighting for better British bread made with fewer additives. It makes for really interesting reading, calling for bread that gives nourishment, flavour and supports local farmers and producers. Come on everyone, lets get on the better bread bandwagon! We are spoilt for choice up here with 3 artisan bakers within a couple of mile radius. Lovingly artisan, staff of life and more bakery. Lovingly artisan provided me with my first proper, could-build-houses-with-this-stuff 100% rye loaf since the last time I was in Germany the other day! Even better, when I didn't think I had enough cash for two loaves, he was happy for me to pay next visit! They're taking over the service stations! Flippin' brilliant - it's pancake day! Are supermarkets really a recipe for success? Looking for a more ethical wipe? Am I ever tempted to just nip in?